Every now and then you might need a break from city life; a few hours to connect with nature. But how do you manage to get your nature fix without traveling too far from the city? You can go to a park. It’s nice. Takes the edge off. But it’s not really enough, is it? 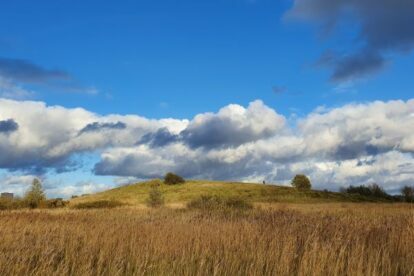 In the north-western part of Amager lies an area of 3,000 acres of protected nature, Naturpark Amager. It is quite unique for a capital to have such a magnificent nature reserve within city limits. There are wide-open spaces and dense thickets, meadows, grasslands, marshes and lakes. Cattle roam (almost) freely for the purpose of conservation grazing. You can pick apples, sea buckthorn, blackberry, elderberry, blackthorn, cherry plums and wild herbs. Or – if that’s your thing – go looking for rare species of butterflies, moths, toads, birds and plants. The history of the area is somewhat bleak. The area called Amager Fælled was an execution site up until 1845, and in the 1900s parts were used as a dump. Before that other parts were used for emptying the Copenhagen latrines. Later it was a military training area and actually wasn’t entirely cleared of ammunition until 2015. All in all, it was a less desirable place to hang out. Now it’s a scenic spot. For picnic with friends, for sunbathing, maybe building a secret fort… or just a nice long walk in the company of nature and your own thoughts.